f.lux vs. Windows 10 Night Light: Which One Should You Use? Do you use your computer late in the day? Do you find it hard to go to sleep or suffer eye strain? If so, you might benefit from changing the color temperature of your screen Can F.lux and Night Shift Really Improve Your Sleep Habits? Can F.lux and Night Shift Really Improve Your Sleep Habits? Excessive use of computers, tablets, and smartphones can lead to deteriorated sleep quality -- but do apps like F.lux and Night Shift really counteract those effects? The science is pretty clear on this. Read More to match the sun. We’re going to look at how to do this natively in Windows 10 and an alternative program called f.lux. Windows 10’s Night Light feature is relatively new, while f.lux has been around for a while and is very popular. We’ll walk you through how to use each utility, describe their features, and help you figure out which is best for you. If you use either of these tools or have your own to recommend, please let us know in the comments below. 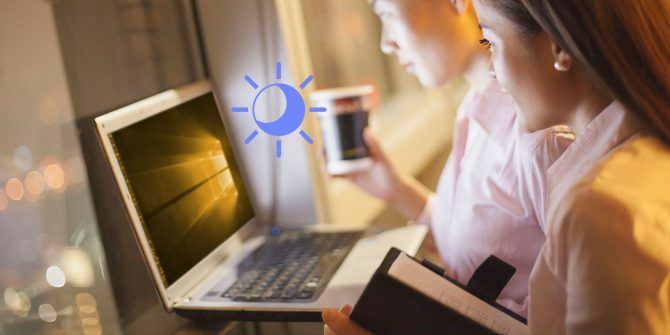 The Windows 10 Night Light Reduce Eye Strain and Sleep Better With This New Windows 10 Feature Reduce Eye Strain and Sleep Better With This New Windows 10 Feature In the Windows 10 Creators Update, you don't have to use a separate app to filter blue light at night. Here's how to turn on Night Light and save your eyes some trouble. Read More feature first appeared with the Creators Update in early 2017. This is Microsoft’s answer to f.lux, though Night Light doesn’t quite have the same advanced capabilities. Nevertheless, it might be good enough for your needs. To access Night Light, press Windows key + I to open Settings and go to System > Display > Night light settings. You can immediately enable it by clicking Turn on now. Move the slider to adjust your color temperature: the further left you go, the less blue light will be emitted. Note: If you can’t find this setting, it means you don’t have the Creators Update. You can also schedule Night Light to activate at sunrise and slowly decrease the amount of blue light until sunset. To enable this, slide Schedule night light to On. It will automatically detect your local sunset and sunrise times. Alternatively, click Set hours to manually set the time for which Night Light should activate and deactivate itself, regardless of the sun. You can quickly turn Night Light on and off through the Action Center. To access this, press Windows key + A and it’ll slide in on the right of your screen. Simply click the Night light tile to turn it on, and again to turn it off. Don’t see that tile? Press Windows key + I to open Settings and go to System > Notifications & actions > Add or remove quick actions. Once here, slide Night light to On. Windows 10 also includes a Dark Mode Dark Mode vs. Night Light: Which Should You Use in Windows 10? Dark Mode vs. Night Light: Which Should You Use in Windows 10? Night Light, a new Windows 10 feature, lets you reduce the amount of blue light emitted by your screen. How is it different from Dark Mode and which one should you use? Read More , which switches many elements from white to black. If you suffer from eye strain, you might find this helps. Enable it by pressing Windows key + I and going to Personalization > Colors. Beneath Choose your default app mode, select Dark. f.lux is one of the most popular color temperature programs — we reviewed f.lux in the past and it still holds up. It’s free, simple to use, and effective. It’ll seem like a drastic change at first, but once you get used to it you’ll find it hard to go without. Head to the site, download and install. The first thing you’ll want to do is right click the f.lux tray icon and click Change location… In this window, input your ZIP code or location, click Search, then OK to confirm. Now f.lux will automatically adjust depending on your local sunrise and sunset. Next, right-click the f.lux icon and click f.lux color and schedule… Use the top right drop-down to choose from the preset color schemes. These will give you different amounts of blue light throughout the day. If you find Recommended Colors too strong, try Classic f.lux. If you want to alter the preset, use the slider to adjust what color your screen goes for bedtime. The further left the slider is, the less blue light, which is what you want as you approach the end of the day. At the bottom is where you can set your earliest wake time. This will shift the timeline of the color change to account for it. You can disable f.lux for an hour at any tim by pressing Alt + End. If you want f.lux to disable itself for fullscreen applications, like games or movies, right-click the icon and go to Disable > for fullscreen apps. If you want to consume media in its true color, this is essential. Finally, right-click the icon and click Options (and Smart Lighting)… There are various miscellaneous options that you can enable here. Backwards Alarm Clock pops a notification when it’s nearing time to sleep, wider slider ranges gives you more color temperatures, and hotkeys can be enabled for quick actions. If you find that your cursor is still a strong white when using f.lux, enable Software mouse cursor when needed and this will resolve the problem. Now your cursor will match the rest of your screen. On the How quickly should transitions happen? dropdown you can choose the speed for which your color temperature changes throughout the day or when switching between full-screen applications if you have that setting enabled. Which Blue Light Filter Is Best? In my opinion, f.lux is the best tool. 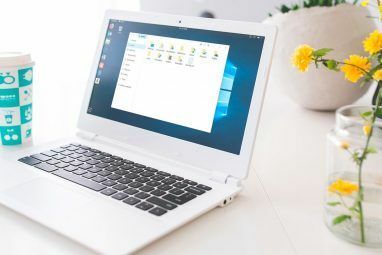 It has more useful features, like the ability to switch between preset color schemes, automatically disable for fullscreen applications, and adjust the speed at which the color changes. However, if you don’t need some of the more advanced features, you might find that Windows 10’s Night Light does the job well. 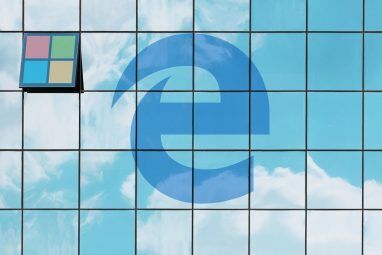 Windows 10 is an ever-evolving operating system, so it’s likely that the utility will grow over time. Do you use either Night Light or f.lux? Which do you prefer? Or is there another program you recommend? This being Windows there's the angle of scripting (with AutoHotkey or PowerShell or whatever). So I tried to make a script to tick ? and untick ? this option automatically when certain displays are connected. Sadly f.lux kinda resists scripting, things could be easier... Maybe it's because it is so cross-platform. I'll get back and post it when it's done if there are replies here. 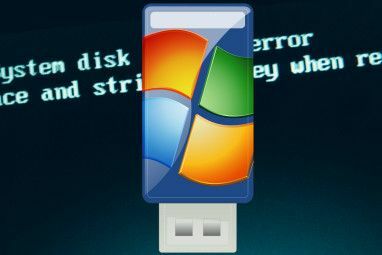 I'm curios if there is some kind of programmatic interface to Night Light that we can access from AutoHotkey or PowerShell. Although it wouldn't be very helpful if you can't map profiles to displays. Flux has been tested and proven to barely block any of the blue light stay away from it. Especially if you are someone who suffers from LED sensitivity get yourself a pair of SCT orange or really good blue blocking glasses. tested by who? It clearly reduces blue light for me. Maybe someone "tested" it disabled? Tested by whom? It clearly reduces the blue light for me. Not sure what you mean by "block blue light" - it doesn't "block" anything, it changes the colour balance so there is less blue light emitted. Maybe the test was done in one of f.lux's many non-default modes in the middle of the day? Or perhaps by tweaking the light rather than the time? I see f.lux is no longer free for businesses, I imagine that will draw more people towards the Windows 10 Night Light mode. I'm using Windows 10 but didn't know about it. Thanks for sharing this trick with us.